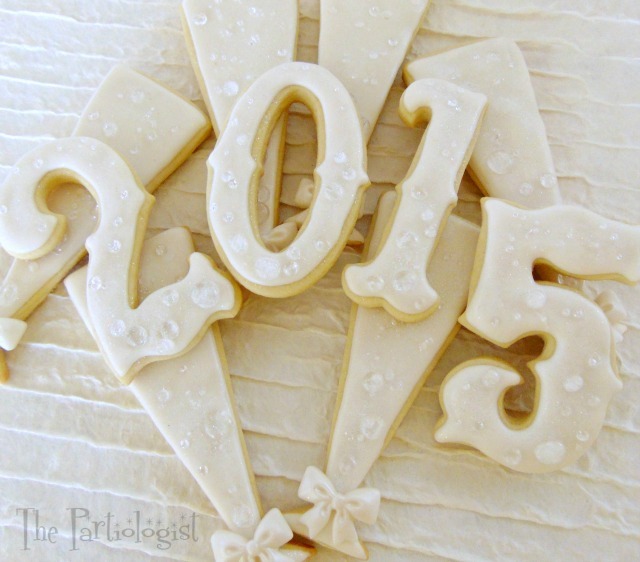 The Partiologist: Champagne Cookies & Candy to Toast the New Year! 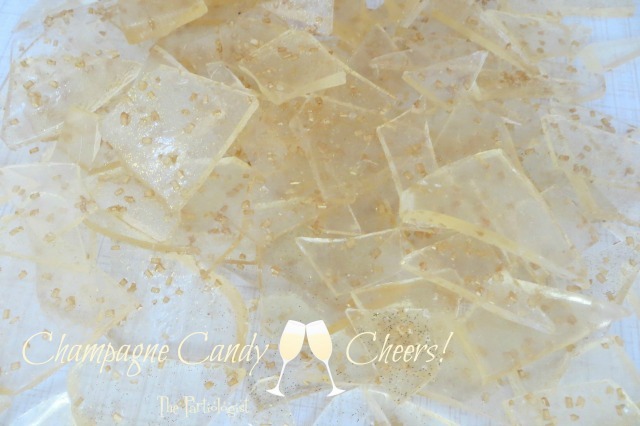 Champagne Cookies & Candy to Toast the New Year! Not only do they look like champagne flutes, they are champagne flavored! Each cookie is topped with candy bubbles and a fondant bow. Because if I were serving these, I would tie a bow on the stem. 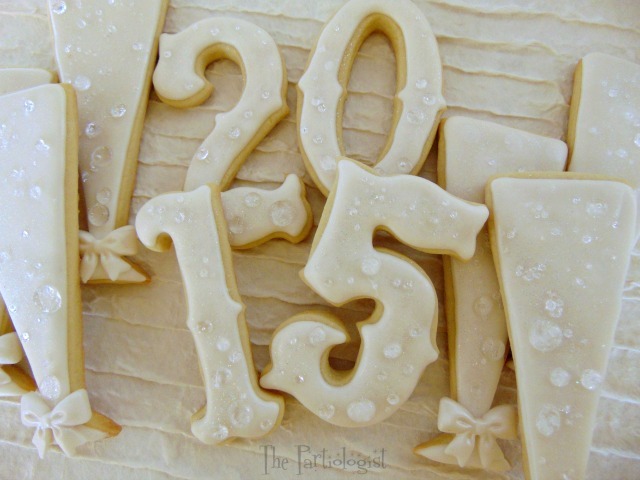 Roll, cut and bake 2015 number cookies along with champagne glass cookies. 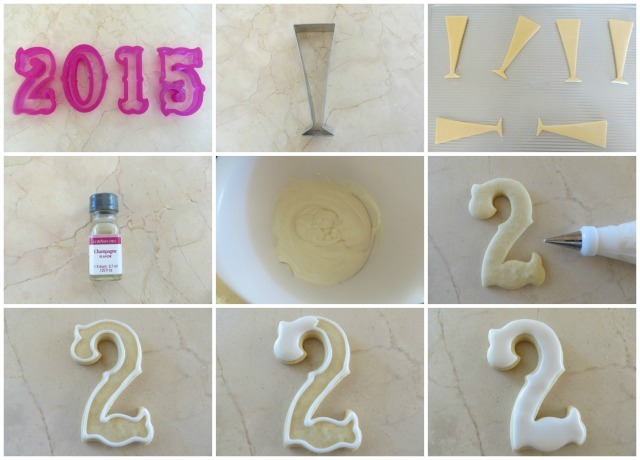 Add just a bit of LorAnn Oil Champagne flavoring to your royal icing. A little goes a long way! Pipe the icing along the edges and then continue to fill in. Use Isomalt candy sticks to make a crystal clear bubble. Regular sugar will not work. 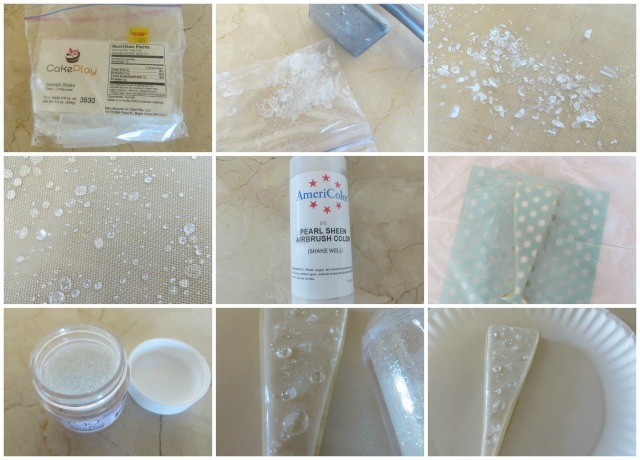 Place a small amount in a zip lock bag and pound until you get tiny pieces. Sprinkle the pieces on a Silpat mat. Bake in a preheated oven at 350 for 1 minute until melted...watch closely! Next I airbrushed a few dots on the champagne cookie with a pearl sheen color. Add the crystals to the cookie, sprinkling on the wet airbrush. Or if you don't want to use an airbrush, add a bit of water to the back of the isomalt bubble and stick on the cookie with a kitchen tweezers (time consuming). Or paint a bit of water to the cookie and sprinkle the bubbles on (quick). After the bubbles are added to the cookie, sprinkle with edible disco dust. •In a large saucepan, mix together sugar, corn syrup and water. Stir over medium heat until sugar dissolves. Bring mixture to a boil without stirring. Remove from heat at 300 degrees F. Add flavoring and stir. Pour syrup into lightly oiled cookie sheet. •If desired, immediately sprinkle with edible gold stars, coarse gold sugar and edible gold glitter. •After the candy has hardened, break into small pieces. Candy and Cookies for the new year. What could be better? 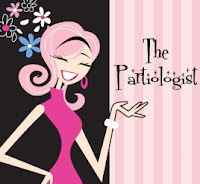 Thank you so much for following The Partiologist this past 2014. It truly means so much to me, that you take time from your busy day to see what I've been up to. I can't wait to share more in the coming year and wish you a wonderful 2015! Thank you Cheryl, Happy New Year! 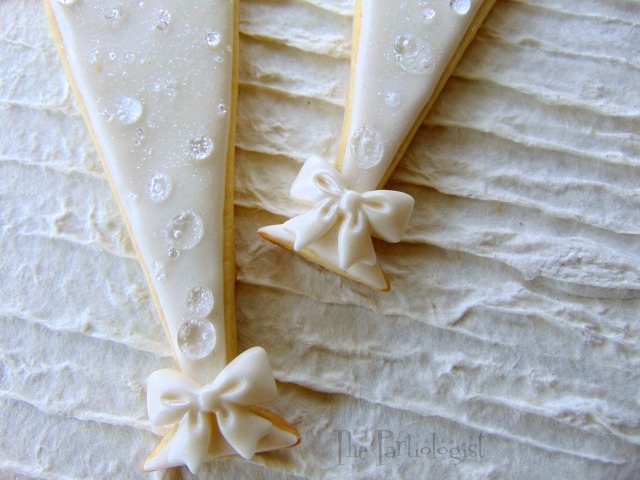 These cookies couldn't be more perfect for a New Year's Eve celebration. I love how you made the isomalt dots to attach to the icing. Happy New Year!!! After seeing these little bubbles popping up all over the internet, I couldn't wait to try them out myself! You're very welcome, they were pretty simple, like you, I've been curious too! Happy New Year! Love this. Simplicity and elegance all wrapped up into one. Happy New Year! Thank you Judy, Happy New Year! BEAUTIFULL. WHERE YOU GOT THE NUMBER COOKIE CUTTERS?